In an Expert Focus article for WaterbriefingGlobal, Dr. Malcolm Fabiyi, Chief Operations Officer and Vice-President of Operations at wastewater remediation technology specialists Drylet, discusses how microbes can help turn wastewater into a valuable resource and play a key role in the circular economy. The circular economy closes the loop on waste streams by reusing them in new processes. Globally we consume about 140 billion gallons of water each day for routine activities like cooking, bathing and washing clothes. Annually, this results in 2 million tons of phosphorous,10 million tons of ammonia and 100 million tons of organic matter – a veritable gold mine of resources that can be reused in a variety of industrial and agricultural applications. The crux of the circular economy potential for wastewater lies in its by-products, specifically biosolids. Technologies that optimize the quantity and quality of nutrients recovered from wastewater and unlock the renewable energy value in the biosolids by-product are key to developing the circular economy for wastewater. Some of the most exciting technologies that are being utilized leverage a basic building block of nature – microbes. Governments and industry largely view wastewater treatment as a necessary cost that they absorb because it is mandated by regulation. Shifting the view of wastewater treatment from a cost burden to a revenue-generating opportunity will help reduce the expense of building and maintaining water and sewage infrastructure .To fully capture the resource potential of wastewater, we need to first advance innovation that optimizes treatment and recovery processes. The agriculture industry is an ideal end-market for biosolids because of their nutrient density, and many new treatment technologies no longer focus solely on removing contaminants like phosphorous and nitrogen, but on converting them into recoverable forms for use as fertilizer. Targeted microbes applied at the right time during the wastewater treatment process can increase the quantities of nitrogen and phosphorous recovered. Over the past two decades, an increasing number of wastewater treatment facilities have been utilizing their biosolids as a source of energy. The Newtown Creek Wastewater Treatment Plant in New York City uses its biosolids for energy production using co-digestion, which involves combining pre-processed organic food waste with biosolids from the plant to increase the production of biogas. A joint project with local utility company National Grid will convert the biogas by-product into enough renewable natural gas for 5,200 New York City homes. This project will help increase the city’s use of renewable energy and reduce the amount of food waste and biosolids it sends to landfills, where they would otherwise emit greenhouse gases. In fact, as part of New York City’s OneNYC sustainability plan, the city has a goal of zero-landfilling of biosolids by 2030. New York City currently produces 1,200 tons of biosolids a day – the business potential for turning all of those biosolids into a resource is huge. Biocatalyst systems that provide targeted microbes can also greatly enhance the digestion process, allowing more biogas to be generated. Along with bioenergy, microbial fuel cells are an emerging technology that can also be used to generate electricity. A microbial fuel cell is a bio-electrochemical device that generates electricity through microbial respiration. In a wastewater treatment plant, microbes called exoelectrogens break down and metabolize carbon-rich sewage sludge to produce electrons that can be used to generate electricity, potentially reducing the energy input to a wastewater treatment plant. Using biosolids as inputs for energy production is an excellent example of operationalizing both the ‘circular’ and ‘economic’ aspects of a circular economy. Reusing treated wastewater is also starting to grow in importance, especially in light of UN Water’s estimate that by 2025 1.8 billion people are expected to be living in countries and regions with absolute water scarcity. Alternative approaches that reduce our reliance on groundwater sources and drinking water is imperative in the face of this impending crisis. A range of commercial sectors are responding to this need with wastewater reuse. For example, Heineken recently opened a plant in Northern Mexico – a region prone to severe droughts – that purifies the water used in production and reuses 30 percent of it in other processes. This model embodies the circular economy mantra of turning waste outputs into new inputs. 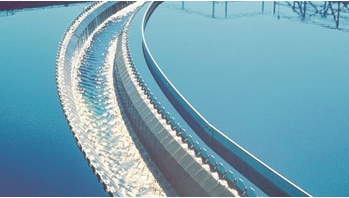 Despite the promising advancements in technology and the growing recognition of wastewater’s resource recovery potential, the circular economy for wastewater has been slow to develop. Part of this is due to challenges with scaling up the quality of treated wastewater. For example, a major wastewater treatment plant in California sends a signification portion of its wastewater effluent to a nearby power plant to use as cooling water. For a region that is no stranger to drought, this efficient reuse of water eases pressure on groundwater resources and is a strong circular economy model that can be emulated across the country. There is one hurdle, however; although the plant meets the regulatory requirements for ammonia levels in its effluent, the value of the wastewater would be higher if it could exceed those requirements and reduce the ammonia content below levels set by regulators. Ammonia in water can lead to ammonia-induced stress cracking in pipes, so lower ammonia levels would help the power plant use even more of the wastewater effluent for cooling without any concern for the lifecycle of its pipes. The challenge for the wastewater treatment plant is to increase the value of its wastewater without the need for large capital investments to upgrade the plant, which inhibits adoption. Thinking beyond traditional tactics can lower the barrier to entry. For example, the microbes that optimize nutrient recovery can be combined with insights from process modeling software to help a plant customize its treatment approach for different end users without building new infrastructure. The advanced process modeling tools determine the operational conditions needed to enhance treatment quality, and the added microbes do the work of executing on the plan. The resulting microbial solutions are more flexible for responding to changing circumstances than fixed infrastructure upgrades. A comprehensive approach to the waste hierarchy can help us recognize wastewater as a vital resource and source of not only water, but energy, nutrients, and other recoverable by-products. Circular economy models for wastewater are the ideal vehicle for turning wastewater treatment plants into resource recovery centers. To hasten that paradigm shift, microbial technologies can be an affordable way to unlock the scalable value and treat wastewater not as a burden but as an opportunity.